MBTA to resume service Wednesday morning, expect delays. RIPTA buses will start operating Wednesday at 8am as road conditions allow. Expect delays and diversions, check their website for updates. Providence Parking Ban ends at 6am Wednesday. No trash/recycling collection in Providence Wednesday, regular service resumes Thursday. PROVIDENCE, RI – Due to the severe winter storm, Providence City offices will be closed during regular business hours on Tuesday, January 27, 2015. Non-essential employees should not report for work. City Hall and all City offices are expected to reopen during regular business hours on Wednesday, January 28, 2015. Garbage and recycling pickup in Providence is canceled for tomorrow, Tuesday, Jan. 27, and Wednesday, Jan. 28, 2015. The collection schedule is not being changed. Tuesday’s and Wednesday’s trash and recycling will be collected next Tuesday and Wednesday. Residents with Tuesday and Wednesday pick-ups are advised not to put their garbage and recycling cans out until next week on their usual pickup day. A citywide parking ban remains in effect until further notice. Residents with overnight parking passes are advised that they cannot park on the street during the duration of the citywide parking ban. All vehicles parked on the street in violation of the citywide parking ban will be ticketed and towed to ensure that roadways can be plowed. In the event of an emergency, always dial 911. Residents are advised that 911 emergency responders may be delayed during the storm. Residents experiencing power outages should contact National Grid at 800-322-3223. Individuals are warned never to touch downed power lines and report downed lines to National Grid or PEMA. 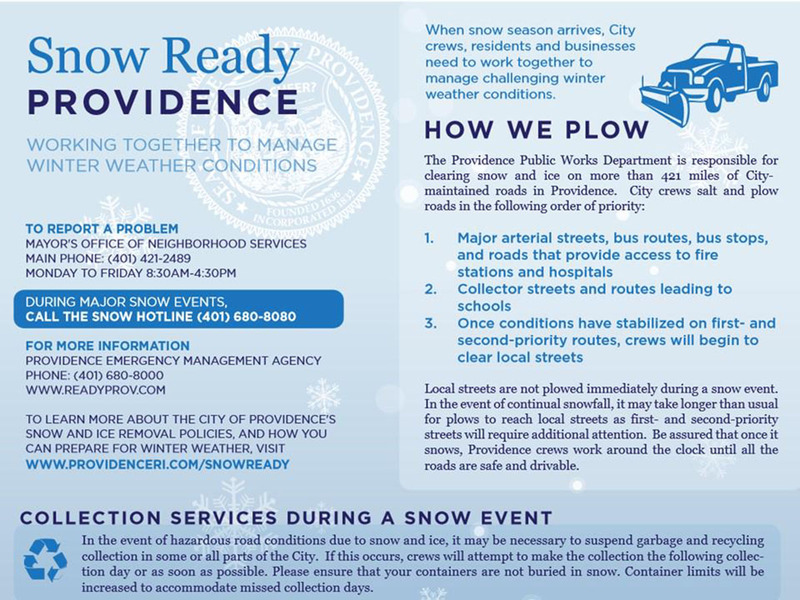 For non-emergencies, a snow hotline is available to Providence residents at 401-680-8080. All afterschool and evening activities for Providence Public Schools are canceled Tuesday, Jan. 27, 2015. City Recreation Centers will be closed Tuesday. PROVIDENCE, RI – Ahead of a winter storm that is forecast to begin Monday afternoon and intensify to blizzard conditions through Monday night and in to Tuesday, Mayor Jorge O. Elorza is announcing a series of preparations to ensure public safety. A citywide parking ban will go into effect at 7pm on Monday, January 26. The parking ban will remain in effect until further notice. Residents with overnight parking passes are advised that they cannot park on the street during the duration of the citywide parking ban. All vehicles parked on the street in violation of the citywide parking ban will be ticketed and towed to ensure that roadways can be plowed. All afterschool and evening activities for Providence Public Schools are canceled Monday. The Providence School Board meeting is also canceled. Parents should stay tuned throughout the storm for announcements regarding school closure. City Recreation Centers will be closed Monday as well. The Department of Public Works has prepared all equipment and personnel to respond to the storm. Roadways will be pretreated ahead of expected snowfall on Monday, beginning with school bus routes. Providence Emergency Management Agency (PEMA) will activate the City’s Emergency Operations Center (EOC) at 12PM tomorrow. The EOC will be staffed around the clock throughout the duration of the snow response. Snow is expected to begin Monday afternoon with significant escalation beginning Monday evening and continuing through the night and into the day on Tuesday. Residents should expect significant accumulation through the duration of the storm and plan accordingly. Cold temperatures and high winds are expected to accompany the snow. A snow hotline is available to Providence residents beginning at 12PM tomorrow at 401-680-8080. Residents experiencing power outages should contact National Grid at 800-322-3223. Individuals are warned never to touch downed power lines and report downed lines to National Grid or PEMA. In the event of an emergency, always dial 911. Residents are advised that 911 emergency responders may be delayed during the storm. If you see a person or a family in need, please do what you can to either lend a helping hand or notify the City. When we all pull together, we are capable of overcoming any challenge. All afterschool and evening activities for Providence Public Schools are canceled Monday. The Providence School Board meeting is also canceled. City Recreation Centers will be closed Monday. 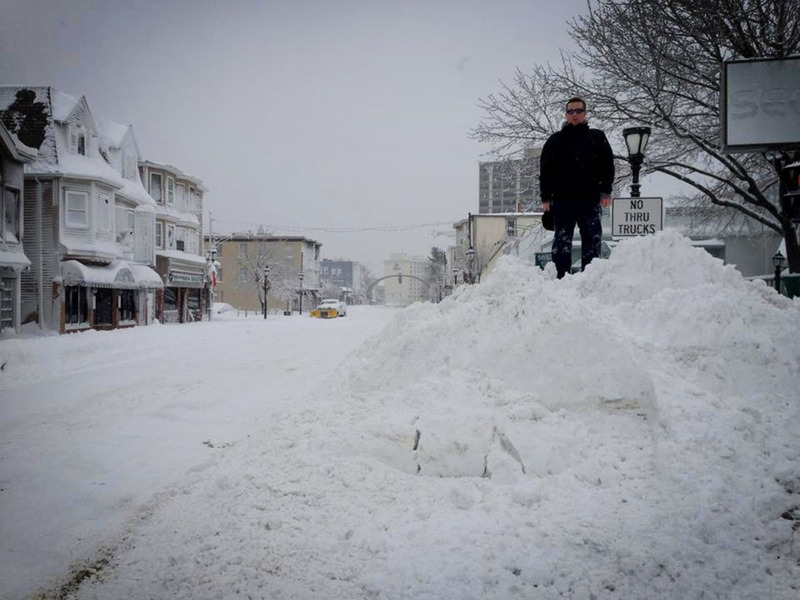 Citywide parking ban will be in effect from 7PM on Monday, January 26 until further notice. Cars in violation of the ban will be ticketed and towed to ensure that roadways can be plowed. Cars parked in school parking lots overnight will also be ticketed and towed. The City is encouraging business to allow employees to work flexible hours to reduce travel during the storm’s escalation. Employees working evening shifts should be prepared for dangerous travel conditions beginning Monday evening. All non-essential employees are encouraged to prepare to work from home on Tuesday. The City’s tax collection deadline will be extended without penalty or interest until Thursday, January 29. The Tax Collector and Tax Assessor’s office will remain open until 7pm on Thursday January 29 to accommodate residents’ schedules. Property owners are required to remove snow and ice from sidewalks, catch basins, fire hydrants and pedestrian ramps adjacent to their property within 8 hours after snow stops falling. Residents are asked to take care not to shovel snow onto roadways after streets have been plowed. Fines ranging from $20 to $500 will be imposed on residents not in compliance. For fire safety purposes, residents are urged not to rebury fire hydrants after they have been dug out. Share your storm photos with us in our Flickr Group or via email.